What is the Konohana Family? 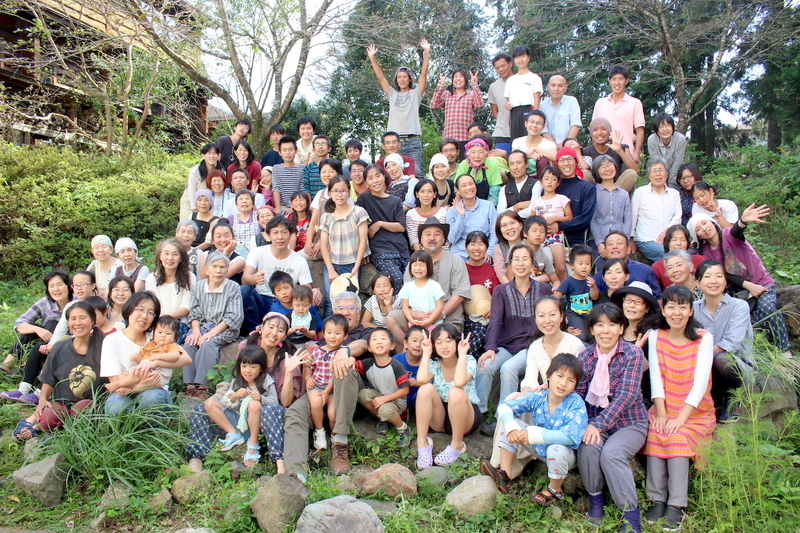 The living of the Konohana Family started with 20 members at the foot of Mt. 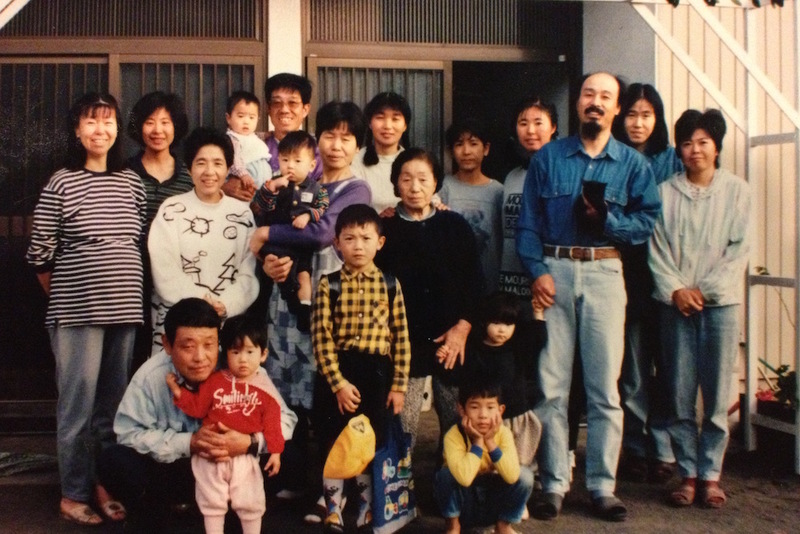 Fuji in Fujinomiya city, Shizuoka Prefecture on March 21st, 1994. The precursor of the Konohana Family is the gathering of people who learned about the “mind” in Komaki city, Aichi Prefecture. It is a little strange man called Jiiji that was in the center. He owned an interior coordinating company at that time. He visited various customers’ places on business, sensed problems of the houses which did not appear on surface, and began to give consultations to many people. When people had listened to talks from Jiiji which they had never heard before, but mysteriously feeling refreshed, they thought “I want to know more about the mind,” and naturally began to gather at Jiiji’s place. Eventually, 20 people moved to the foot of Mt. Fuji in Fujinomiya city, Shizuoka Prefecture and founded the Konohana Family in order to create a place where they actually practice their words, instead of just talking about it. It is the thought of “creating the Village of Bodhisattvas at the foot of Mt. Fuji” that was at their core. Bodhisattvas are the existence that considers the joy of other people and the society as their own. “Let’s create a place where people gather, talk, harmonize with nature and live spiritually abundantly.” Nobody knew where their living would be heading at that time. “I do not know how it is going to be. However, this way of living will be surely important in the coming era.” As if they went beyond their individual will and became driven by something great, those who felt it “important” started the Konohana Family, feeling around in the dark on Spring Equinox, 1994. Currently, many issues are occurring on earth. Looking at any aspect such as politics, economy, environment and education, the world has reached a dead end critically. Each issue has been intertwined with each other complicatedly, which has become an even huge problem. It seems like it is extremely difficult to solve that. However, the reality is very simple. Everyone hopes their body is healthy and lives. They hope their family is healthy and live, because all the family members’ happiness makes them happy. We bask in the sun light, eat the food nurtured by the earth, drink water, receive wind, breathe in air, and live every day. The source of all circulation is the sun, and the sun is one. The earth is also one, and so is water, wind, and air. That is, we are all the family who were born from one source. As a matter of fact, there are a wide variety of living beings which could be said as 870 million kinds on earth. Any one of them plays a unique role, links with each other, and establishes the majestic life network of the global ecosystem. The ecosystem is in the circulation which natural elements of the sun, earth, water, wind and air weave together. It is as if the earth itself is one body. From limbs and organs to each cell, various complicated functions create a network brilliantly, work together, and form one life of “the self” in our body. Nothing exists alone. Only when every single existence plays an original role which cannot be replaced by others, links with each other, and becomes connected, the whole can live healthy including itself. Now, we humans have destroyed our own body and live a life which hurts our own family. However, as we maintain the health of our own body and wish for our family’s happiness, originally, it is very natural and easy to maintain the health of the earth and wish for the happiness of all existences in this world. It is because this is the true figure of this world, and we humans are given life in such a system. Humans, which is just one species out of 870 million kinds of living beings, is an extremely unique existence even on earth. The earth is full of truly various lives; however, in the same species, a difference in individuals is not so big. A difference in individuality rarely exists between sparrow A and sparrow B. It is almost the same between beetle A and beetle B. However, as for humans, each one of them is extremely unique even in the same species. Their appearances are different, and their inner aspects are more diverse. Preferences, ideas and the paths of life are completely different by people. The species which is this full of diversity would not exist anywhere else, even if we search in the whole universe. The human society has required people to become uniformly the same for a long time. They have created a model like “this kind of life is good,” and everyone has aimed for it. As a result, they have generated disparity and conflicts. However, originally, this world exists based on diversity. Because every single existence is different, when different individuals become connected, they create a beautiful harmony and express an abundant world of life. When we look up at the sky, the sun has its own role and so does the moon. Other numerous stars play their original roles, and continue to move in the universe. It is a majestic universal symphony. Infinitely diverse existences link and resonate with each other, and play one majestic harmony. The earth also moves together in such a world, so morning and night come on earth every day as if it is promised. Four seasons go around, and time passes. If the earth, the sun and other stars do not link with each other, and exist separately, our lives would disappear instantly. That is, the source of the universe is in connection. Connection means love which exists under promise. Humans is just one species out of 870 million kinds of various living beings on earth. If everyone is the same in the same kind, humans must be more harmonious. However, each one of them is extremely unique. The reason why humans were given such a diversity is that the world entrusted expressing the universe to us. Hope those with various individualities will support and utilize each other, become connected, and live. And hope everyone will become more abundant. It is the expression of love, which is the source of the universe. Humans have fought due to their differences in the past. They have fought, separated, and desperately gathered so that their own potion becomes sufficient. As a result, they have generated more conflicts and contradictions. However, originally, the universe is the world with perfect free energy. The earth moves in the universe at the surprisingly fast speed of 30km per second, and has never refueled for a long time. In the same way, the sun and other stars also move at the high speed, and continue to shine without extinguishing the light even for a moment. The energy will never run out. When we follow this system of eternal harmony, we will be able to live in the world with infinite free energy. In the energy consumption-oriented society, in which people have forgotten to become connected, have separated, and have scrambled, they have become hurt and lonely rapidly. However, the world with free energy, in which everything is in harmony and circulates beautifully, is very calm. When we encounter it, our mind becomes gentle because it is calm and comfortable. It is the true figure of the world where we live. The Konohana Family was born as a place to express the original figure of this world in which we live. It is an expression of the home of souls, the original place for us who were born on earth with the body. Therefore, that beautiful expression does not have to be only at the place of the Konohana living. It is an original figure of the earth and the universe. Humans have lost that destination and taken the path for a long time. Going through a long long way, the Konohana Family is a place where everyone will realize “Yes, this must be it” as the destination of their path, and where they will welcome back themselves. Such an expression is the purpose of the Konohana Family’s existence. Those who have become aware of the truth will fully bloom unique “individual flowers” which are never the same. When such colorful flowers become connected and resonate with each other, they will become a beautiful big tree in full bloom. If all beings on earth resonate with each other, become connected and live, how beautiful and abundant this world will become. We have not known the true preciousness of the earth, the planet full of lives, which is rare and exceptional even in the universe. The Konohana Family continues to take the path toward such a great possibility every day. © Konohana Family, All rights Reserved.